(CHRR – 18 March 2011) According to reports received today, each of the seven Baha’i community leaders were sentenced to 20 years imprisonment in the appeals court. They have been notified of their sentence in prison. On 15 September, the court only announced “orally” to their defense lawyers that the Baha’i leaders’ sentences were reduced by half—from 20 years to 10 years. However, today’s report confirms a 20-year sentence, ignoring the change from September. 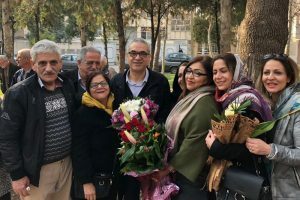 Their 20-year sentence—totaling 140 years for the seven Baha’is together— was initially handed down in August 2010 by Branch 28 of the Revolutionary Court. 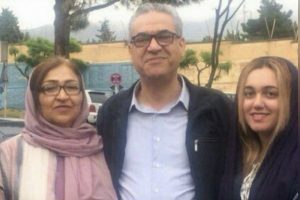 On 13 March, the wife of one of the prominent Baha’i community leaders, Jamalden Khanjani, passed away, but the authorities refused to release him and prevented him from attending his wife’s memorial services. Reports also indicate a massive presence of security forces at the memorial for Khanjani’s wife. Six of the seven leaders of the Baha’i community in Iran were arrested simultaneously by security guards on 14 May, 2008. The seventh leader, Ms. Mahvash Sabet, has been in prison since 5 March, 2008. They have such courage. I feel so fortunate. This at least clarifies the catastrophic failure of the regime for all the world to see and it firmly establishes the selfless heroism of these devoted souls as an indelible part of Iran’s history for all time. Our prayers are with the heros -both those in prison and those waiting at home. God willing, the patience of all will soon be rewarded. They have detained totally innocent citizens in cruel conditions in an attempt to make an example and dissuade other citizens from showing sympathy towards a way of thought that promotes unity in diversity and hence jeopardizes a society constructed on hatred and fear. One wonders what explanation they could provide if they decided to release them. “The root-cause of wrong-doing is ignorance”. My heart goes out to these valiant souls, God Willing, may they be released as soon as. Soon there will be changes and these outrageous injustices will be addressed. The darkest hours before dawn! What the regime is really doing is repeating, in essence, the same scenario that prevailed at the time of Moses, Jesus Christ, and His Holiness Mohammad. The history of the early days of Islam is replete with similar injustices and cruelties against the early believers. What did the enemies of Islam do to Imam Ali? They killed him while he was offering his prayers to God in the mosque. How soon we forget the tragedy of Imam Hussein? He was beheaded by the enemies of the Faith. Baha’is are harmless people. The seven Baha’i prisoners are innocent. They are truly dedicated to building a better Iran, free from prejudices, injustices, inequality and violence. Iran’s destiny is crystal clear; it will be a true paradise on earth regardless of what we do today. Wouldn’t it be better if we could say “Yes, we were a part of building this paradise on earth”. Let us not forget the other victims; the children, parents and spouses who are left behind. I know of young children who live in constant anxiety, parents who are suffering from uncertainty of day to day living. Spouses who are lonely…. Let us remember them in our prayers so that they may be sustained on the strength of our heroes.